PennsylvAsia: Emperor opens March 8 at Squirrel Hill's Manor Theater. Emperor opens March 8 at Squirrel Hill's Manor Theater. 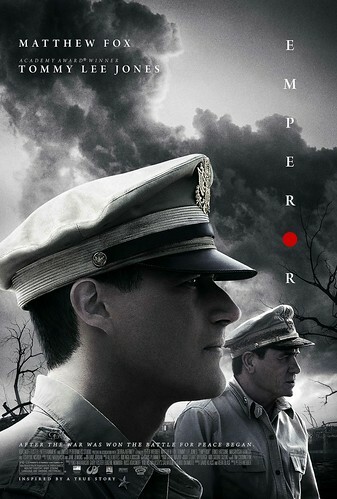 The movie Emperor, starring Tommy Lee Jones as Douglas MacArthur and dealing with the question of trying Emperor Hirohito as a war criminal following World War II, opens nationwide tomorrow and will be in Pittsburgh at Squirrel Hill's Manor Theater. As General Douglas MacArthur (Jones) suddenly finds himself the de facto ruler of a foreign nation, he assigns an expert in Japanese culture - General Bonner Fellers (Fox), to covertly investigate the looming question hanging over the country: should the Japanese Emperor, worshiped by his people but accused of war crimes, be punished or saved? The City Paper didn't really care for it--[it] "might have been informative and even provocative, but winds up being a lackluster, unsatisfying affair." ---and it's doubtful 100 minutes of pop history will do justice to a question with lingering implications today. The Manor Theater's page has showtimes for Friday and the weekend.